If you've ever ridden in a triathlon, time trial, or cyclocross, then you'd know that these disciplines are made for 1x cranksets. The SRAM Red 1x D1 DUB Crankset offers demanding riders and racers the right mix of features which include aerodynamics, durability, and simplicity. It has a single-ring drivetrain that simplifies your riding and reduces weight since you won't have an extra chainring or front derailleur. The SRAM X-Sync wide-tooth, narrow-tooth chainring technology provides exceptional chain control while you're riding and the laser-etched chainring finish is more durable. The 48T and 50T versions of this crankset come with a direct-mount aero chainring for better aerodynamics, but non-aero chainrings can be installed with a single tool. 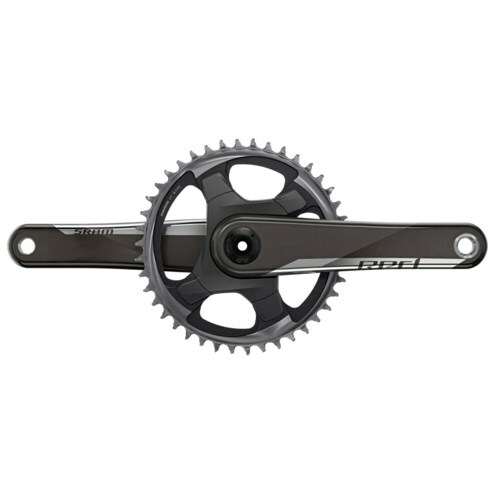 On top of all this, you can upgrade this crankset to a power meter so you can train and race with maximum efficiency. So if you're looking for the perfect crankset to fill your 1x needs, then you'll love the SRAM Red 1x D1 DUB Crankset.